In large pot, bring 12 cups of water to a boil. Add noodles and let boil 8-9 minutes or until noodles are tender. Strain in colander and transfer noodles to a medium bowl. Let cool 5-10 minutes. While noodles are cooling, prepare the sauce by combining garlic, ginger, tamari, syrup, sesame oil and red pepper flakes, in a small bowl. Whisk together until combined. Prepare vegetables, and add them to the noodles. 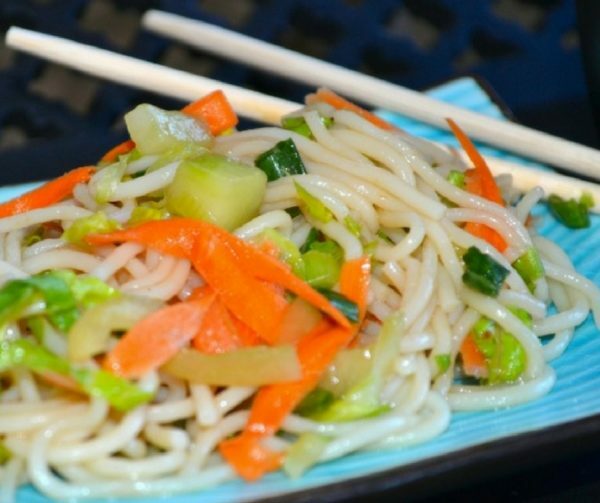 Pour sauce over noodles and gently toss together vegetables, noodles and sauce until well combined. Serve the noodles warm or cold.